America has already staked its claim on the Greatest License Plate Ever Of All Time Forever, but a challenger has arrived. 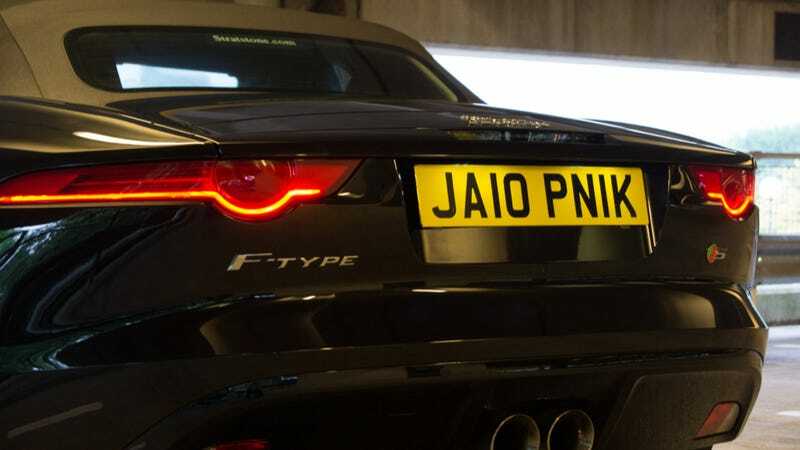 In the opposite corner comes Great Britain, with this absolutely gorgeous JA10PNIK plate, stuck on a Jaguar F-Type S.
The guys over at CarWitter saw a gauntlet being thrown when Ciecierskif put his beautiful Jalopnik plates on his Ford Focus, even though they're soon to be attached to his BMW 2002. They felt that the plates needed to be on something with a bit more vroom than the Focus, and when they received the Jaaaag to test they stuck the Euro-Jalop plates right on the back. Finally, took three and a half years for some one to finally post this up. In all fairness, the guys at CarWitter may have cheated a bit. It turns out that the JA10PNIK plate is sadly not road legal. Unfortunately the actual name is one letter too long to fit on a standard, legal plate, so in real life it would just read "JA10PNI." Close, but this is for the title of Greatest License Plate Ever Of All Time Forever, and the reward of Boundless Respect, and we like to keep it kosher around here. Even still, CarWitter went out and got the plate custom made anyways just to snag a great pic, according to editor Adam Tudor-Lane, so that's got to be worth something. The challenge has been issued. Which license plate of the two is the Greatest License Plate Ever Of All Time Forever? Let us know below in the comments! Oh, and if you think that with two challengers this question can be settled, you're wrong. Keep creating fantastic plates, and one of these days we'll have a true battle royale to find the winner.